Our firm recently signed on as one of several designers/design teams transforming rooms in Carrier Hall in the Central Gardens Neighborhood for the 2010 Decorators' Show House benefitting the Brooks Museum League. The house is, well, WOW. It's basically an English Tudor mansion, built in the 1920s. It's one of many, many structures in Memphis on the National Register of Historic Places. The period details are incredible, as are the tastefully accomplished updates that make the house functional for the 21st century. And therein lies our challenge. 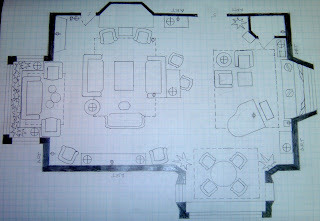 Because what room did we choose to tackle in this monstrous, gorgeous house? The ballroom. Yes, ballroom. It's enormous. Cavernous. Beautiful. Scary. Scary because modern-day houses don't have ballrooms. Modern-day families don't host balls. We host gatherings, sure. We host parties. In fact, we love to entertain. So our task in approaching this roughly 30' x 40' space was to bring this antiquated space into the current millennium. We wanted the room to reflect the diverse entertainment needs of a family in 2010. That means making the most of its wide open spaces by creating distinct areas designed for different activities. The ornate, original fireplace topped by elaborately carved wood panels will be the backdrop for a cozy conversation grouping. A pretty little nook surrounded by spectacular leaded glass windows will house another seating area and also serve as a conservatory of sorts, urns filled with greenery topping the benches that surround it. Another nook provides a great spot for a beautiful antique table and four contrastingly modern upholstered chairs. This area could just as easily be used for game-playing or puzzle constructing as for a casual dinner. Yet another nook, this one containing a built-in platform we instantly saw as a "stage" is the ideal setting for a mahogany grand piano generously loaned to us for the project by Amro Music. A small seating area offers a perch for impromptu concerts. There's even a spot for homework or household paperwork - an antique desk provided by Palladio, our partner on the project, that backs up to one of three sofas. The room, when we're finished with it, will be a "family room" on a grand scale. A space that will accommodate a party of 50 as easily and comfortably as an intimate conversation between two people or a casual night at home for the family. The key word here, and our goal, is to make it "livable." And, seriously - whoever gets to live here is soooooo lucky.